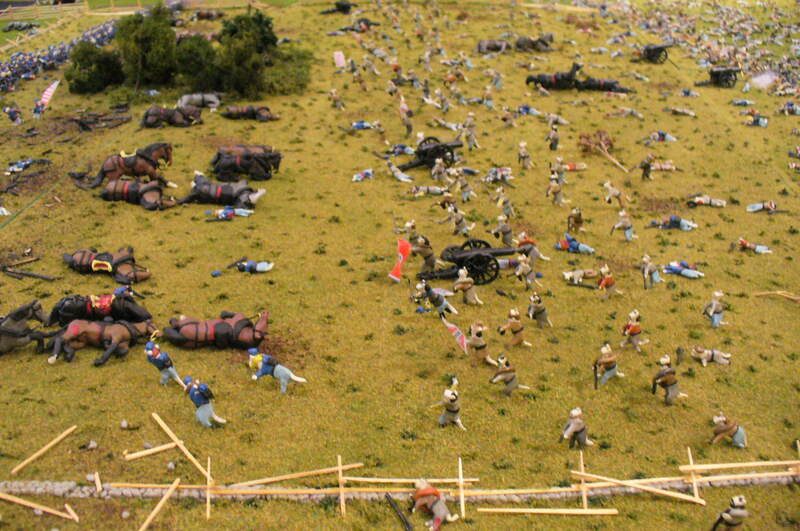 Currently, our largest diorama is of the fighting at the Angle during Pickett’s Charge at Gettysburg on July 3, 1863. 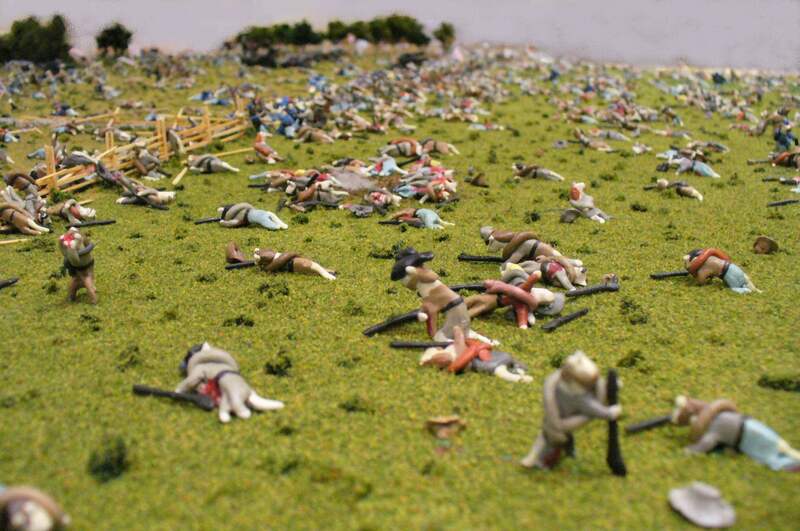 Begun in 2000, “The Fate of Gettysburg” measures 5.5 ft x 7.5 ft. and has 3,000 soldiers on it, as well as hand-made artillery, horses, and stone walls. And in case you are curious, yes, all the stones in the famous stone wall are individually made from clay. 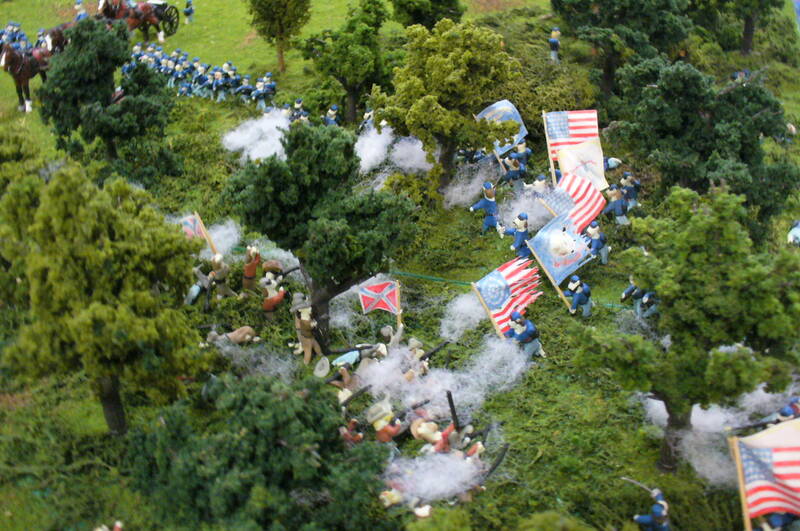 This diorama shows the moment in time when the fate of Gettysburg, according to Lieutenant Frank Haskell, “hung upon a spider’s single thread.” Moments earlier, Confederates had poured over the wall, following General Lewis Armistead and pressing into the Copse of Trees. The 69th Pennsylvania found itself fighting for its life in front of the Copse, with its right wing bent back at a right angle and the Confederates threatening its rear. The 72nd Pennsylvania stood on the crest of Cemetery Ridge, firing at the oncoming Confederates but ignoring Lt. Haskell’s pleas to charge. Union reinforcements crammed into the Copse, but were held in check by the Confederates. Both sides fought desperately, slugging it out with bullets, rifle butts, rocks, and even fists. But neither moved forward. For a moment, it seemed time had frozen. And then, in the Copse, Corporal O’Brien of the 1st Minnesota took up his regiment’s flag and ran forward. On the crest, Color Sergeant Murphy and one other man finally responded to Lt. Haskell’s pleas and ran forward with the 72nd’s flag, only to fall wounded. When those two flags moved forward, something happened inside the Union troops. The heart of a regiment was its flag, and when it went forward, you followed it. When it retreated, you retreated. When Cpl. O’Brien ran forward, his regiment dashed after him, and the other Yankees who were crammed into the Copse followed. When the men of the 72nd Pennsylvania saw Sgt. Murphy fall, they yelled and charged. The fate of Gettysburg now swung fully into Union hands. The Confederates were pushed back over the wall and those who escaped capture began the long trek back to their lines on Seminary Ridge. The grand assault by the divisions of Generals Pickett, Pettigrew, and Trimble had failed, leaving General Lee no choice but to retreat to Virginia the next day. The Civil War would rage for two more years, but on July 4, 1863, the Confederacy’s fate was sealed. Gen. Lee had been defeated in Pennsylvania, and in Mississippi, Gen. Grant was accepting the surrender of Vicksburg.